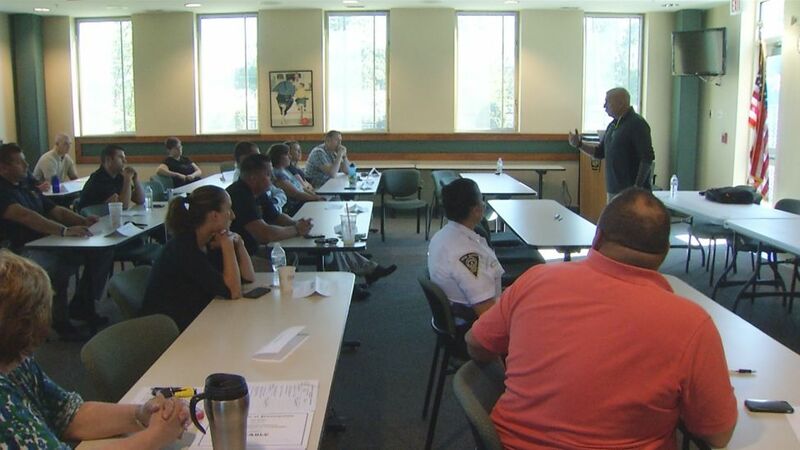 A room full of police officers from cities and towns across Connecticut gathered at the Wethersfield Police Department Wednesday morning for special training in de-escalation. With police and community relations being top of mind across the country, from Ferguson to Baltimore, retired Lt. Ray Hassett says the workshop put on by the Connecticut Alliance to Benefit Law Enforcement is even more relevant. “The last thing police officers need when we arrive to help is not to be trusted, so we have to do a little more work to earn back that trust,” Hassett said. Through role-playing and discussion, officers were taught the importance of pausing before reacting at a crime scene. Another hot topic during the training was body cameras. A lot of police departments are getting the cameras and Hassett says they are an opportunity for police to learn from every interaction. “Much like a good sports teams we like to watch some good game films so we can figure out how we can do better,” Hasset said. The training is a tool the public cannot see, but something Sgt. Michael Connolly says is key to working with the public and keeping everyone safe.